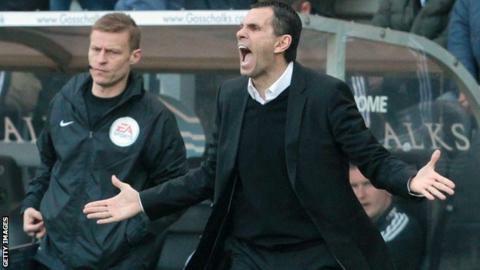 Sunderland manager Gus Poyet has responded to criticism of the team he sent out for Sunday's FA Cup quarter-final defeat by Hull. He changed six of the side and three Hull goals in nine second-half minutes dashed any hope of a return to Wembley. Phil Bardsley, Lee Cattermole, John O'Shea, Sebastian Larsson and Jack Colback were the only Sunderland players to start the League Cup final and the FA Cup tie against Hull. "If we were playing Real Madrid, maybe [critics of the team selection] would have a point," he told BBC Newcastle. "But that team was good enough to win." Five of the six players brought in against Hull also started Sunderland's 1-0 victory over Southampton in the fifth round. Hull were still to score when Fabio Borini and Adam Johnson, starters against Manchester City at Wembley, were introduced after 67 minutes. "People will criticise, but you cannot go back - some of them haven't got a clue what goes on behind the doors," Poyet continued. "Wes Brown and Craig Gardner were injured, Jozy Altidore and Valentin Roberge ill, Emanuele Giaccherini started and he is one of our most expensive players, Steven Fletcher is coming back and Ignacio Scocco needs to play. "There are no excuses from me, if someone wants to look for some, then fine. I'm man enough to say we played 11 first-team players that were certainly good enough to win the match." Defeat by the Tigers capped a difficult fortnight on Wearside with the cup losses following a in the Premier League. Because of their cup commitments, Sunderland have played only one league match in the last month and have slipped back into the relegation zone, placing huge importance on Saturday's home game with Crystal Palace, who they will leapfrog with victory. "If I was a player, going to play the team three points ahead, I wouldn't be affected or down just because there is no more cup and no more Wembley," Poyet added. "If there are weak players in the dressing room feeling sorry, I assure you they will not play. "I cannot control everything, but I will say to our fans is that we'll do everything to prepare a team to beat Crystal Palace."